CAM manufacturer, OPEN MIND Technologies AG, will be presenting the latest edition of its hyperMILL software solution at the International Paris Air Show. The trade fair, which is taking place in Le Bourget, France, is the largest and most important meeting point for the aerospace industry. On Stand G77 in Hall 4, OPEN MIND will demonstrate innovative CAM technologies that allow companies to make their manufacturing processes more efficient and reduce machining times by up to 90 percent. With its hyperMILL CAM system, OPEN MIND offers intelligent solutions to meet the challenges arising in the aerospace industry. The hyperMILL MAXX Machining performance package, in particular, provides users with modules for highly efficient roughing, finishing and drilling operations that can offer fast economic benefits when working under increasing time and cost pressure. “The aerospace industry is one of the most technically demanding industries. Manufacturing companies operating in this area face considerable challenges such as high cost pressures, precision, difficult materials, efficient procedures and certifiable processes. OPEN MIND caters for these parameters by offering reduced machining times of up to 95 percent in machining environments that demand large material removal volumes. The way to achieve this is to fully exploit all the possibilities offered by modern tools and machine tools with the help of CAM methods. And that’s where we come into play,” says Peter Brambs, Principal Engineer of Product Innovation at OPEN MIND. hyperMILL MAXX Machining roughing strategies make it possible to achieve far higher material removal rates per unit of time. At the same time, there is much less stress on tools and machines. High-performance machining features optimal milling paths, maximum material removal rates and the shortest possible machining times. The strategy for extremely rapid material removal is also available for materials that are difficult to cut (for example, titanium) and can be used for 2D, 3D and 5axis milling tasks. OPEN MIND has developed a special method for the highly efficient finishing of steep and flat surfaces: 5axis tangent plane machining with conical barrel cutters. As these conical barrel cutters feature particularly large radii, they enable milling with wide path distances with the same theoretical scallop height. The result is high-quality surfaces with extremely short machining times and increased tool life. In practice, this method of machining results in time savings of 90 percent and more. 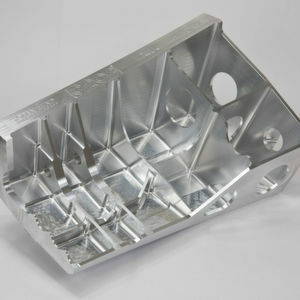 The drilling module includes the 5axis helical drilling power strategy that can easily and efficiently machine holes.. This cycle involves helical tilt milling whereby only one tool is needed for different drill diameters. Pre-drilling is not necessary and the strategy is very well suited for materials that are hard to chip. hyperMILL features numerous automation options that enable extremely efficient and easy machining of complex workpieces. For example, OPEN MIND offers special hyperMILL packages for impeller, blisk and turbine blade machining.